This past month I have worked on some really special quilts! I have selected 2 quilts to highlight in this email. 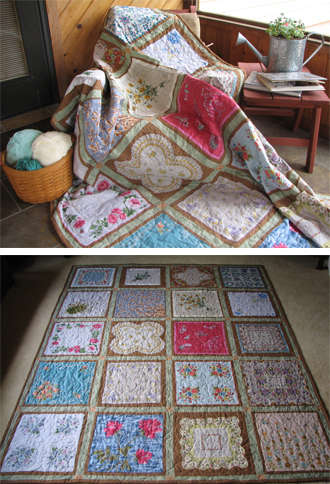 This 70" by 95" traditional style quilt was made for one lucky girl as her bridal shower present from her mother. The 20 hankies are from her great gandmother's collection, and a few of them were hand sewn on this quilt by her grandmom! I took care of the rest! What' so special about hankies? Everything! They are beautiful pieces of high quality linen or satin fabric that have ornate embroidery or pictures on them. Handkerchiefs have been a part of world culture for thousands of years. 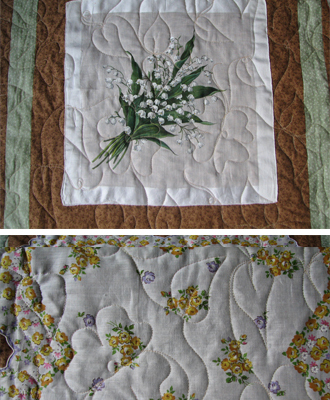 Is the name of the special long arm quilting stitch that was used to accent the hankies and give the quilt an extra soft look. The longarm quilting really makes this quilt a true work of art. There are several stitches to choose from. This brightly colored 68" by 73" modern lap quilt was made with 25 t-shirts! It costs $250.00. 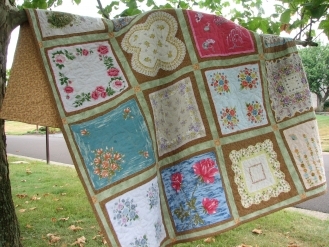 Beautiful green, brown and gold were chosen for the hankie quilt. These color selections really accent the hankies so beautifully! Bright reds and greens were chosen for the modern lap quilt. Is really jammin' in this quilt! So is Van Halen! We love rock 'n' roll t-shirts! How many rock 'n' roll t-shirts do you have filled with rock concert memories? 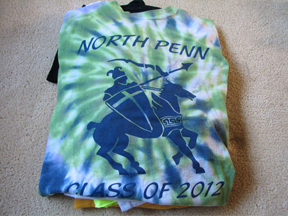 Bright colored shirts really makes these quilts pop! This quilt was backed with a super soft, super bright red flannel. I selected a meander longarm quilting stitch that helps the t-shirts stand out. Or you can drop by and see a few handmade quilts and we can discuss yours! Copyright © 2012 Memory Quilts by Molly All rights reserved. Your are receivingt his email because you have shown interest in Memory Quilts.